Orbital is still developing the Launch Abort System for the Orion spacecraft, although the program would be cancelled under the White House's new NASA policy released in early February. 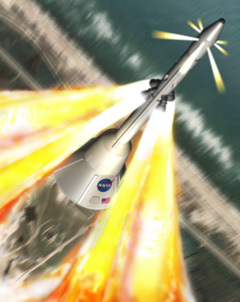 The abort system would generate 400,000 pounds of thrust from a solid-fueled motor for a fraction of a second, enough power to rapidly whisk the Orion capsule, and the astronauts inside, from a failing rocket during launch. "If the Constellation program is wrapped up, I think the Launch Abort System work that we've done is one of those elements that should have an excellent opportunity to be transferred into future human spaceflight systems, whether those would involve Orbital putting the entire system together or supplying the Launch Abort System to some other prime contracter that might be in the running for that work," said David Thompson, the company's chairman and CEO. Thompson addressed financial analysts in a phone teleconference Thursday morning, in which Orbital officials discussed the company's results from the 4th Quarter of 2009 and previewed projects in 2010. According to an Orbital spokesperson, the firm expects to recognize between $55 million and $60 million in revenue from the abort system contract in 2010. Revenues from the program were $200 million and $100 million in 2008 and 2009, respectively, the official said. "This trend reflects the fact that most the design and engineering work was done up-front and now the team is focused on testing what they've designed," said Barry Beneski, an Orbital spokesperson. NASA has not stopped work on the Constellation program yet. The needle-shaped escape rocket is due for a crucial ground test called Pad Abort 1 at the White Sands Missile Range in New Mexico some time in April. During that test, the abort system would simulate an emergency on the launch pad and propel the boilerplate Orion spacecraft airborne. 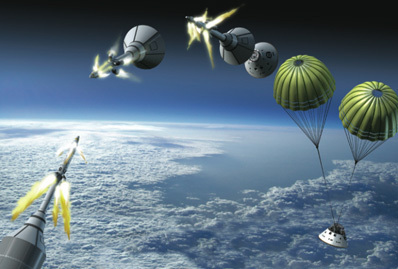 The capsule would separate and parachute to a landing about a mile away after one minute of flight. "There is not an official date for the PA-1 test, but we are still working toward that launch," said Grey Hautaluoma, a NASA spokesperson. In place of the Constellation program, NASA is planning to turn over responsibility for human spaceflight to commercial transportation services. Leading contenders for the new role in space operations include major contractors like Boeing Co. and Lockheed Martin Corp. Orbital and Space Exploration Technologies Corp., or SpaceX, are also vying for the space transport job. "I think the work we've done over the last two-and-a-half years [with the abort system] should be pretty directly transferrable into one or more of the human spaceflight systems that NASA would expect to promote over the next five years," Thompson said. Any new commercial spacecraft will almost certainly require an escape system for astronaut safety. Orbital and SpaceX are developing new rockets and space cargo freighters to carry equipment to the International Space Station on operational flights beginning in 2011. SpaceX is currently targeting its first demonstration flight to the space station in July. Orbital's first mission of its Taurus 2 rocket and Cygnus spacecraft is scheduled for March 2011. Thompson said Orbital's schedule for launch early next year is "busy and tight" due to a hectic pace of construction, manufacturing and testing of ground and flight infrastructure. There is essentially no remaining schedule slack, Thompson said. Thales Alenia Space of Italy has already started constructing Cygnus pressurized cargo modules. Orbital will start manufacturing Cygnus service modules in Dulles, Va., this year. First stage engine tests are scheduled in Russia next week to probe the propulsion system's abilities by taking the engine well beyond the Taurus 2's expected flight conditions. "What we're really trying to do here is push the engine well beyond what we would expect it to produce on a regular launch, particularly in terms of its run time," Thompson said. The Taurus 2 first stage is powered by two AJ26 engines provided by Aerojet. The AJ26 engines are based on the NK-33 power plant developed by Russia in the 1960s for the ill-fated N-1 moon rocket. An earlier round of Russian engine tests in October was abruptly cut short after an undisclosed issue. Frank Culbertson, an Orbital senior vice president, said during a January interview the problems were in the engine's liquid oxygen turbopump. Aerojet will deliver the first engines to the Stennis Space Center in southern Mississippi in April to begin acceptance testing before being shipped to the Taurus 2 launch site at Wallops Island, Va.
"Those tests will take four different engines through that test cycle between the end of April and July or August," Thompson said. "Two of those four engines will then be sent at the end of the summer to the Wallops Island launch site, where they will be used in full Stage 1 system level testing of the Taurus 2 rocket in the fall." The Taurus 2's first stage tank will begin structural testing in Ukraine in March. Other portions of the booster's internal structure and payload fairing will also be tested this spring. Orbital expects a ground test unit of the Taurus 2 to arrive at Wallops by the end of this summer for a series of fit checks and pathfinder demos.